It’s my birthday month, I will be 30 on the 30th! Neat, right? Which brings me to this, my brother, Lawrence, was in town a few weeks ago and bought me a spiralizer as a very early birthday gift. I couldn’t be more thankful, because now I can make “zoodles” (zucchini noodles). In an effort to become healthier, I have changed my entire diet. So, the blog will reflect some interesting recipes. For the most part, eating now is so boring. I can’t eat beans, bread, pasta, sugar, and most fruits — it’s insane, especially for me. However, because of the changes in my diet, it has required me to get a little more creative, in different ways — so, challenge accepted. 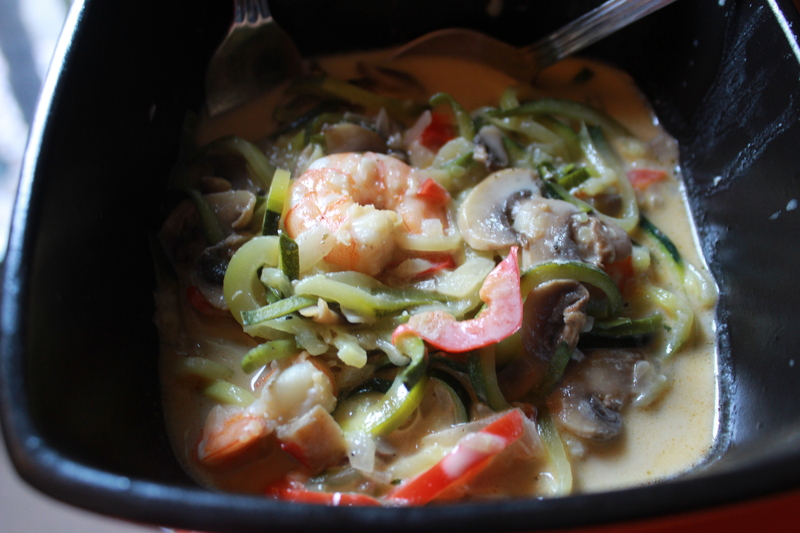 Since I am on a high-fat/high-protein diet, I added some heavy cream to this recipe, which is not something you typically find in most scampi recipes. In a 5 1/2-quart Dutch oven over medium heat, heat the oil. Add shallots, mushrooms, and bell peppers. Stir occasionally until shallots become translucent. Add the shrimp and cook for 2 minutes, or until all of the shrimp are red. Add the zoodles and mix everything together. Add the chicken broth, heavy cream, lemon juice, cheese, and spices. Stir to incorporate, turn the heat up to high, and bring to a boil. Once it comes to a boil, drop the heat to medium-low, and cover with the lid for 5-10 minutes. When it’s done, transfer to a bowl or a deep plate and garnish with more parmesan cheese (something I forgot to do).